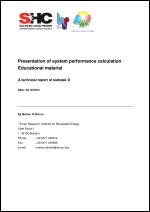 IEA Task 44 / Annex 38 has produced free available educational material on the subject of performance figures evaluation for Solar plus Heat Pump (SHP) systems. The aim is to develop supporting material useful during teaching activities on the topic of Solar plus Heat Pump systems. The content addresses the definition of several performance indicators developed within Task 44 / Annex 38. The material has been derived from the activities of Subtask B. More detailed information on this topic can be found in the deliverable B1. In the final slides an example is additionally presented for clarifying the relevance and the meaning of each single performance figure.